Posted on 09-18-18 at 3:08 p.m.
As a "back-to-school" post and in light of the upcoming Quebec provincial election, I thought it would be interesting to look at the voters who support each party, based on their personal values, hot buttons and mentalities. Just as we do with our clients' brands and their target-market segments, we can examine the motivations of these voters to better understand what drives their choices. Each party represents a vision of society, along with specific aspirations for our society and its members. When we decide to vote for a particular party, we are in fact supporting the values it represents. Through our Panorama program, CROP has been studying the values of consumers and citizens for more than 30 years. Using the tools of this program, we have analyzed the four main parties in the current electoral race. 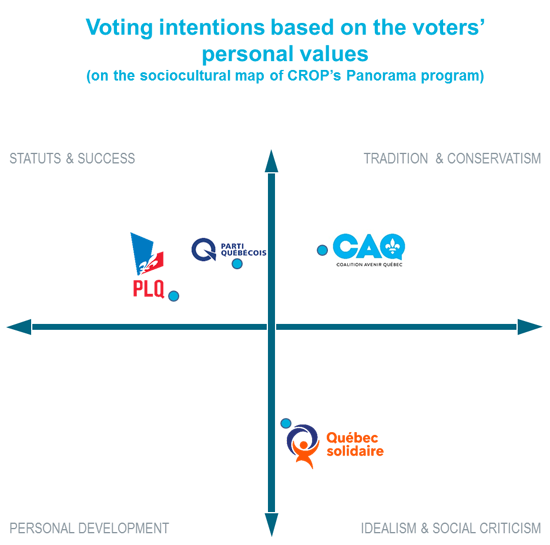 • Québec solidaire (QS) presents itself as the incarnation of social-democratic idealism in its pursuit of social equality and progress. The values of the supporters of each party appear to be nicely aligned with the electoral platforms and the public discourse of their party, as we can see in the current election campaign. Quebec Liberal Party: social success, pride, multiculturalism and "Canadianism"! Although the federalism/sovereignty schism no longer dominates the sociopolitical landscape, Canadian and Quebec identities are still in opposition for many Quebecers, particularly at the regional level between Montreal and the rest of the province, where a Quebec identity is stronger. The Quebec Liberal Party resonates with Quebecers who feel that they are Canadian first and foremost (without necessarily denying their Quebec identity). These voters aspire to a Canada whose role as a model nation on the world stage embodies excellence in many areas. Pride is undoubtedly the "mentality" underlying their enthusiasm for this identity. The QLP is also a party of "achievers," for whom social status is a social marker of supreme importance: they aspire to success, to an enviable social status that they can flaunt to their entourage and to society at large ("Keeping up with the Joneses"!). Unsurprisingly, they also express great humanity towards ethnic communities and a keen openness to the world. They see themselves as citizens of the "global village." 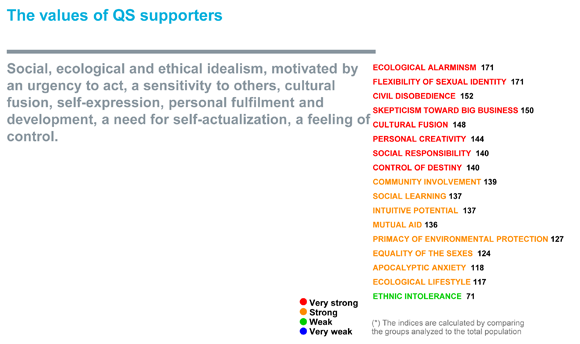 Indicative of their slightly older demographic, QLP supporters are somewhat conservative and value the traditional family, religion and a sense of duty. Based on the values of its supporters, the QLP is the party of social success, multiculturalism, tradition and Canadian pride. The Coalition Avenir Québec: our Brexit! There is a certain conservatism, a nostalgia for more defined, more stereotypical roles for men and women. They aren't involved in discussions about gender equality (which they consider a debate for Montreal and the Plateau!). Thus, the CAQ perfectly embodies a populism resulting from a society that is changing too fast, where their supporters no longer see themselves reflected, where "the people" have been forgotten. The CAQ gives them a voice. The PQ: in search of a lost country! The vast majority of people who still call themselves sovereigntists are allied with the PQ. They are the opposite of QLP supporters, identifying primarily with Quebec and very little with Canada (they live in the regions). They also display a victim mentality: they feel socially excluded by a society that is changing too fast. Their high degree of community engagement provides them with the comfort of being useful and productive. The feeling of exclusion among PQ supporters creates a fantasy of civil disobedience and rebellion (we can almost hear the pots and pans banging!). These Quebecers have a sense of frustrated fulfilment, which sovereignty could have prevented. While the loss of their sovereignty dream has left these voters feeling defeated, they still have a great deal of pent-up energy to assert themselves, transcend current constraints and express their uniqueness. Consumption has become a social marker for them. Their feelings of exclusion make them crave the status that consumption provides. Ethnic intolerance is also part of these voters' profile. 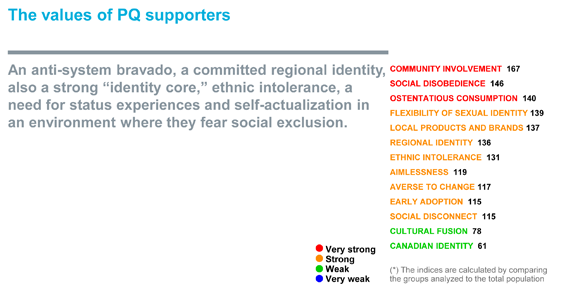 Their ideal country is first and foremost for "old stock" Quebecers. Similar to the CAQ, immigrants are welcome but only if they quickly adopt our customs and values and leave theirs behind. Hence the competition between these two parties on the issue of Quebec identity. Thus, the PQ expresses melancholy for a lost country (after two referendums), commingled with feelings of exclusion from a society that is changing too fast. Québec solidaire: the idealism of possibility! As one might guess, responsibility and social and environmental engagement are at the centre of these voters' motivations. They act like our conscience-a constant reminder of the challenges facing society and a very critical attitude toward companies and institutions that do not do their duty (or worse ...). This engagement is fuelled by a feeling of urgency-for the threatened sustainability of our planet and its resources, for the widening gap between rich and poor; by a feeling of looming social and ecological disasters if nothing is done, along with the conviction that we can fix things if we just put our minds to it. For these QS supporters, apocalypse is a project: an opportunity to change the world! This engagement also has a component of personal fulfilment: the belief that everyone has potential just waiting to be realized-a dream of personal development fostered by solidarity. Finally, we should not be surprised that these supporters display the highest level of multiculturalism of all the parties. Not only do they warmly welcome foreigners, they are convinced that their contribution will enrich our society (cultural fusion). A profoundly humanist party that dreams of self-actualization for all! The social divisions described in the profiles of the voters of each of the major Quebec parties are now found in just about every Western country. This is what happens when societies change too quickly. On the other hand, Quebec, along with the country as a whole, still has a chance to avoid even greater divisions because our inequities do not yet threaten the social fabric. Our "right wing," so to speak, is still less extreme than in many other countries. Our social programs and Canada's social awareness still bridge the ideological gaps. Let's hope that the future evolution of our society continues to foster this relative social harmony. My musical clip of the week is Macbeth by Giuseppe Verdi. Despite all the failings of modern Western democracies, democracy as a political system still remains the most civilized way to exercise power. This has not always been the case. Over the centuries, bloodshed was more often than not the order of the day. In this excerpt from the opera of this Shakespeare tragedy, Macbeth's wife fantasizes about becoming a queen and prepares herself to convince her husband to kill the king in order to seize power. And she intends to use her sexual prowess to get him there! Giuseppe Verdi: Macbeth, Lucic, Pape, Netrebko, Calleja, Luisi, The Metropolitan Opera Orchestra, Chorus and Ballet, Deutsche Grammophon, New York, 2014.